i've forwarded this to the management so they'll see it, but keep in mind that it's Christmas so they might not see it immediately. Just to ask; where were you downloading this from? 5.51 could be either the Free or Pro version. Did you key in any payment/card details? Did you receive an Activation Code to also key in? If not then you haven't bought anything and have downloaded the Free version. If you were downloading it directly from Piriform, or from the Filehippo site (which is the 'official' distributor), then they would not have your payment/card details so could not have taken any payment from you. Unless you subsequently keyed in your card details, which would hardly be 'suddenly'. (And would be an odd thing to do if you wanted the free version). 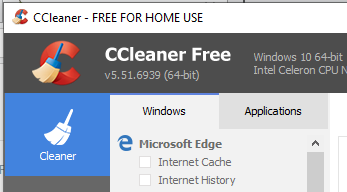 Any of the 'non-afiliated' download sites that carry CCleaner would not have your payment/card details either. However if you have purchased it from Amazon, or the like, then what you have purchased is an Activation Code. In that case you would need to contact the company that was selling it on Amazon, rather than Pirform themselves. If you purchased it directly from a computer stores website, then you should contact that particular store. PS. have you installed and run the programme? If you have then it will tell you in the top-left corner if you have the Free or Pro version. I've replied to your PM seperately, as you say you didn't give them any card details then there is no way they could have taken any payment so you are fine. If you are seeing the 'Pro' features enabled then you will have downloaded a 14-day trial, which will just disable the Pro features after 14 days leaving you with the Free version.